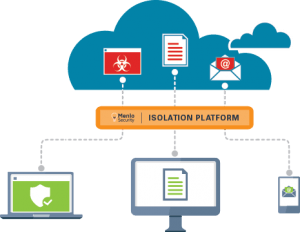 The Menlo Security Isolation Platform (MSIP) eliminates the possibility of malware reaching the devices of end users from key attack vectors including web and email. Menlo's patent-pending virtualization and Adaptive Clientless RenderingTM (ACR) technologies completely isolates a user’s session meaning all content (e.g. Java, Flash etc.) is fully contained in the MSIP platform. Only safe, malware-free rendering information is delivered to the user’s endpoint. Malware or Ransomware has no path to reach an endpoint, meaning legitimate content needn’t be blocked by IT security. 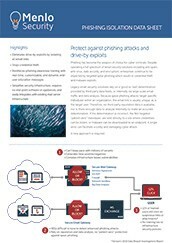 Administrators can open up more of the Internet to their users while simultaneously eliminating the risk of attacks. 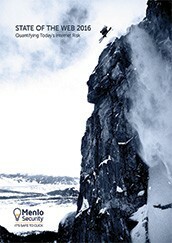 Want to find out more about security through isolation? Just let us know how we can contact you and one of our Trusted Advisors will be in touch. Get a demonstration of security through isolation in practice. 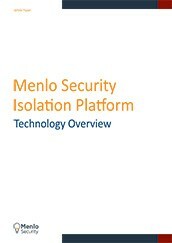 See the Menlo Security Isolation Platform (MSIP) in action. Use the form to schedule your demo.